At Southwell Corp we have been providing practical solutions to industry for over 30 years. We sell a variety of products that serve municipal, industrial, pulp & paper, and chemical plants. We specialize in selling top quality FRP and instrumentation. Welcome to Southwell Corp. Our Fiberman division supplies molded and pultruded FRP Grating and Fiberglassstructures throughout USA and Canada. 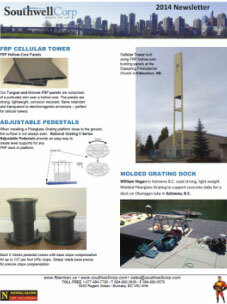 Our FRP products include molded grating panels, fiberglass beams, angle, channel, tube, flat sheet, and plate as well as FRP ladders and railing. We manufacture and distribute internationally the BLOX BLX-SP2 Black Liquor Oxidation Sensor. In BC we represent Greyline, Ershigs, Ramco, Crane PSI, Kytola, Ametek. BW Controls, Kobold, Barben, Baum, Combined Fluid, Huber, Magnatrol, Micromold, Madison, Wasco and Peeco instrumentation. Serving: Halifax, Montreal, Quebec, Toronto, Ottawa, Ontario, Winnipeg, Manitoba, Saskatchewan, Calgary, Edmonton, Alberta, Kelowna, Vancouver, Victoria, BC.